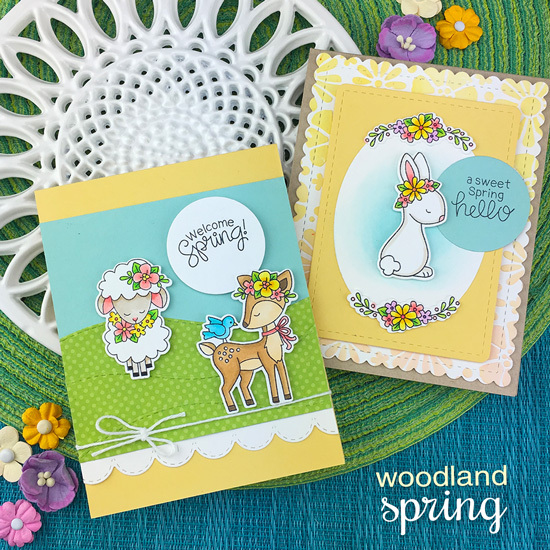 Today is reveal day two for our February Release and we have an another adorable set of woodland friends to share today called Woodland Spring! We are having a giveaway today too, so make sure you read all the way to the bottom of this post to see how to win! Get Inspired with Cute Spring Critters on projects from our Design Team! 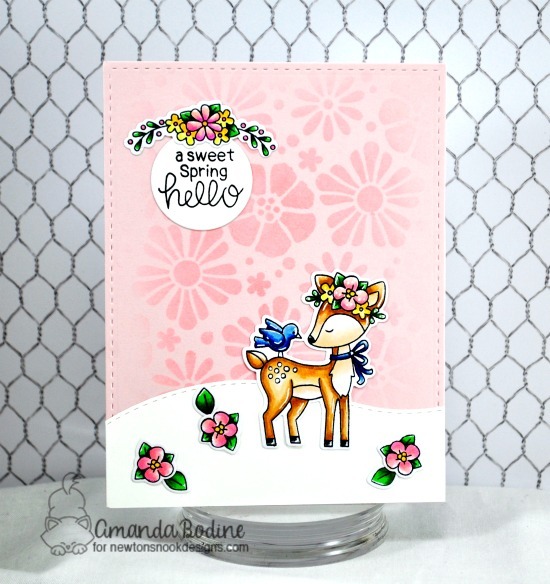 Amanda created this sweet spring card featuring the deer from the new Woodland Spring Stamp Set. She also used the new Bold Blooms Stencil to create a pink floral background and added in a hill using our Land Borders Die Set. Holly created a fun trio of woodland friends ready for spring on her card today! She colored the deer, fox and bunny from the new Woodland Spring Stamp Set, adding fun white gel pen details. She also added fun strip of flowers behind them, stenciling the flowers using our new Bold Blooms Stencil and cutting it into a curve using our Land Borders Die Set. The white banner was cut out using our Frames & Flags Die Set. 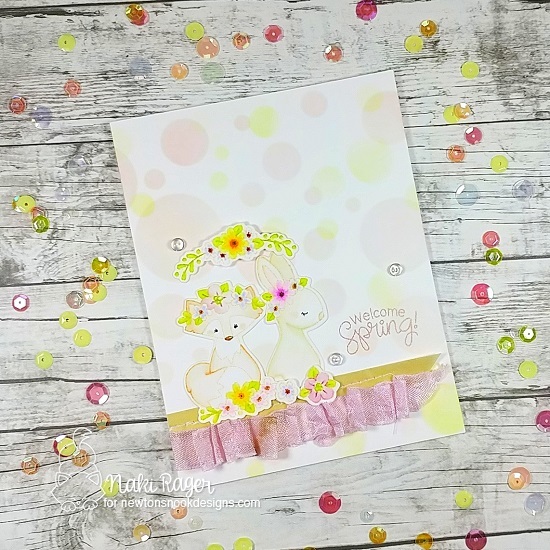 Maria created this adorable card filled with sweet spring pastels! She started with a colorful background created with our Bokeh Stencil Set and then layered a lovely spring scene over the top. She used the cute deer from our new Woodland Spring Stamp Set and included some trees using our Forest Scene Builder Die Set and a hill using our Land Borders Die Set. 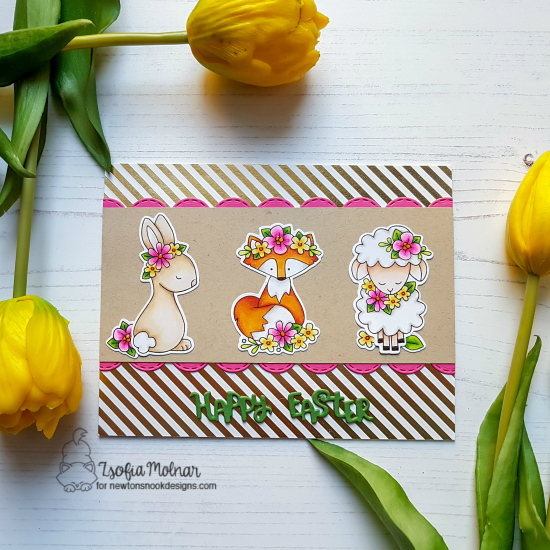 Zsofia created an adorable trio of Easter friends using the bunny, fox and lamb from the new Woodland Spring Stamp Set. She colored them in bright colors and added them in a row onto her card. She added a fun pink scalloped edge using our Sky Borders Die Set and the "Happy Easter" die cut is a peek from a set that will be revealed later this week! This darling deer card by Samantha is perfect for sending wishes to a friend. She colored the sweet deer image from our new Woodland Spring Stamp Set and added him to her card over a lovely distress ink background. She also added some embossed flowers in the lower corner using our Bold Blooms Stencil and embellished the image with even more flowers from the Woodland Spring Stamp Set. 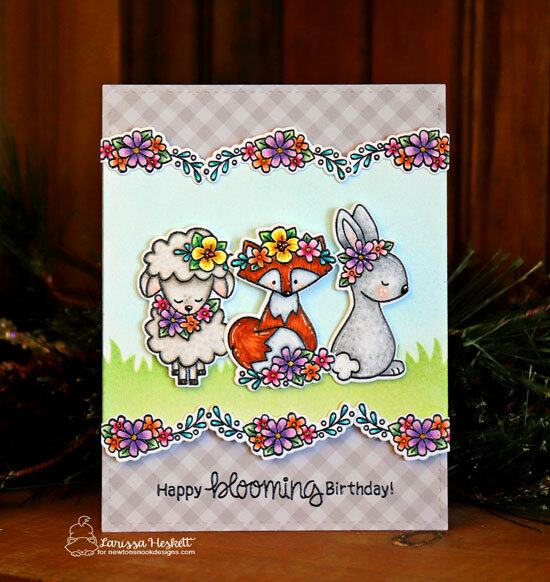 Larissa created this sweet birthday card using three of the adorable animals from our new Woodland Spring Stamp Set. She colored them in vibrant colors and added them onto her card, layering them over some grass that was added in using our Land Borders Die Set. She also added an edge of flowers above and below them using the floral image from the Woodland Spring Stamp Set. She finished out the card with the sentiment from the Loads of Blooms Stamp Set. Spring couldn't get any sweeter than this charming card by Ellen. 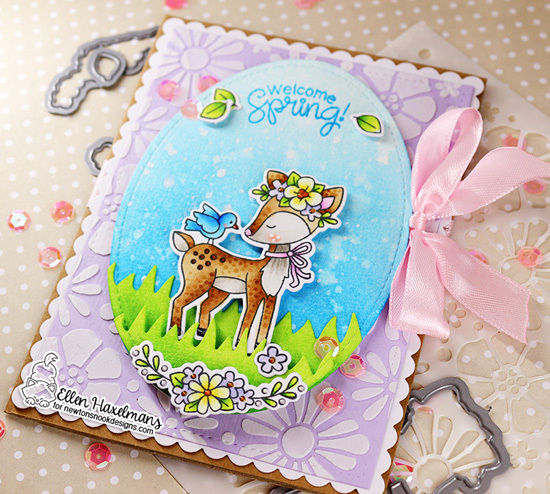 She created a cute scene inside an oval shape featuring the deer image from our new Woodland Spring Stamp Set. She added some grass using our Land Borders Die Set and some extra flowers along the bottom too. For her background she used our new Bold Blooms Stencil with white embossing paste and added a scalloped edge using our Frames & Flags Die Set. This card by Naki is perfectly pretty in pastels that are just right for Spring! She used the fox and bunny from our new Woodland Spring Stamp Set, coloring them with no line coloring and soft colors. She also added in some additional flower springs around them to make it even cozier! For her background she used our new Bokeh Stencil Set to add soft bubbles. 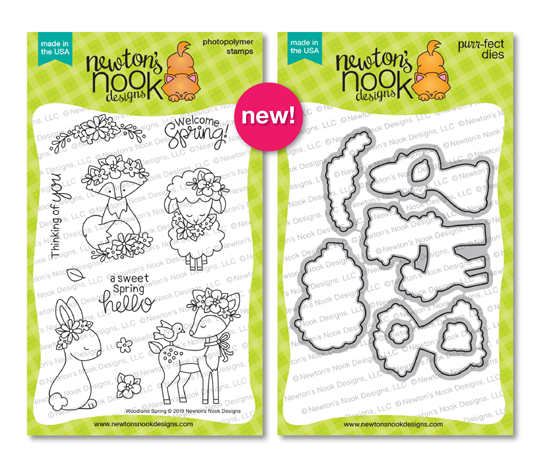 The cute critters in our new Woodland Spring Stamp Set are so perfect for creating scenes. 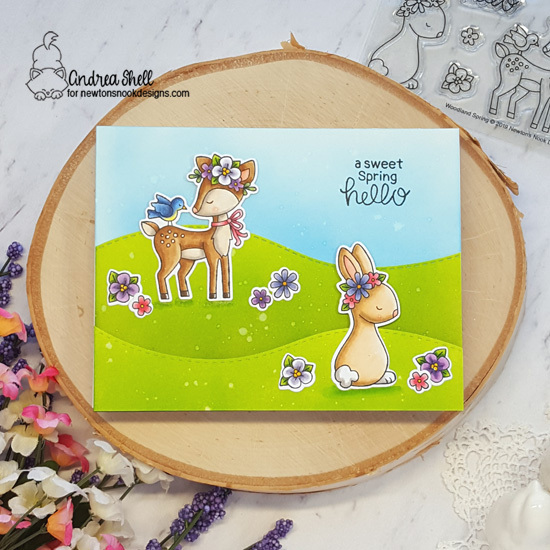 Andrea created this adorable setting for the bunny and deer using our Land Borders Die Set and distress inks! So simple and pretty. The animals and flowers really pop off those grassy hills! Tatiana also created a sweet forest scene for her spring card today. She used the deer and bunny images from our new Woodland Spring Stamp Set, coloring them in soft pastels. Then she created a lovely setting for them using our Land Borders Die Set to create hills and added in some trees using our Forest Scene Builder Die Set. It's so cute how she added stamped flowers into the trees too! Oh my! This is a must have for me. I adore the darling critters with their flower details. The design team inspiration is amazing as always. Love the darling critters!!! Adorable cards!!! Woodland Spring is soooooo cute!! These spring cuties are fab and have been beautifully showcased by all the designers on this fun hop. I just adore the animals with flower wreaths!!!!!!!!!!! Another adorable deer and critter set, love it! Love the flowers on these sweet woodland critters. Oh. M. Gee this is a precious set!!! Darling critters. Gorgeous flowers. Awesome inspiration, as usual, by everyone. These little critters are so adorable! Thanks for the chance to win. Awwww.... these are adorable! I love each card! Love the Woodland Spring set with these sweet animals! These are so cute stamps! Love inspiration projects from team! What could be sweeter than flowers and darling woodland critters?!! Oh, yikes! My little mind is screaming WANT! So adorable. It doesn’t get any cuter then this! Love the woodland animals dressed in flowers for a Spring! This definitely is the cutest spring stamp set I have ever seen :-) And you have an amazing design team, love al the cards you are showing here! So much sweetness by all the designers! Adorable cards & stamp images. This is such a cute set! Gorgeous cards! These critters are so cute, just love this set! So cute stamps and cards! OMG, I love this set. It's so cheerful and bright!! Great release! The cards are so adorable. These are so cute! I love this new set! Great cards and love the critters with their flowers.